It’s not every day that a child at Regional Health Rapid City Hospital gets to celebrate their last chemotherapy treatment. That is why Oct. 8 called for a bubble parade. What is a bubble parade? 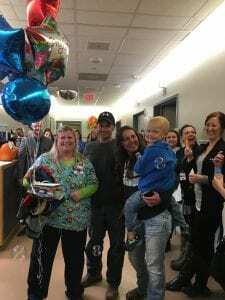 Over 100 caregivers from various departments lined the halls of the pediatric department, each blowing soap bubbles into the air so that Quintyn Kilcoin and his family could be greeted with an endless stream of bubbles as they left his patient room. Quintyn, a 4-year-old from Hill City, had received weekly chemotherapy treatments since May. Regional Health Rapid City Hospital worked in conjunction with his pediatric hematology/oncology team at the University of Minnesota and his local primary care provider, David Mueller, D.O., to provide the needed treatment. About 60 new caregivers were about to begin their afternoon orientation session when they received a last-minute invitation to participate in the parade. Sarah Baker, new to the Learning & Organizational Development team, appreciated the opportunity to see how Regional Health’s mission, vision and values are put to work. While Quintyn seemed very shy initially, Sarah saw his reaction change as he moved through the hallway. Sheila McKinstry, RN, CPN, organized the parade, which was the first of its kind at Rapid City Hospital.